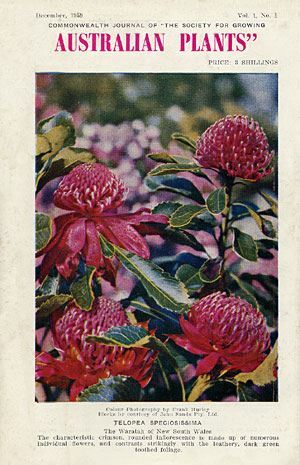 The East Hills Group of the Australian Plant Society was formed an the inaugural meeting of the Region in 1957 - making it the oldest Group in New South Wales. Since its formation, the Group has had Flower Shows - in early times at St Christopher's at Panania in conjunction with the Orchid Society. Later, the display was held at Bankstown Girls' High School, Bankstown Town Hall and eventually at Bankstown Square. Founding member, the late Bill Payne, had foreseen the greater need for reliable information about our native flora. The community mindset 50 years ago was that natives were too difficult to grow. Hence, he took it upon himself to take on the job as editor of the journal, Australian Plants, in December 1959 - a role he continued for 42 years! Today the journal is acclaimed worldwide and is the main publication of the Society. Along with another journal, Native Plants for New South Wales, Australian Plants is issued to members of the national Australian Plant Society four times a year.